Mommy Peptalk: Where’s My Pat on the Back? A few months ago, my teacher Rabbanit Yemima Mizrachi advised us to bless our kids before they leave for school in the morning. I’ve been blessing my kids every weekday morning ever since, and I’ve been loving it. And my kids have too. I think the Weisberg kidlings really crave that extra concentrated dose of Eema love and blessing before they rush out the door at 7:21 AM for the big wide school-ish world. “May God bless you and guard you. May God make His face shine upon you and be gracious unto you. What a wonderful feeling it was to give that blessing. At the moment I said it, it plucked me up by the scruff of my neck out of the sisterly bickering and the perpetually runny noses and the middle-of-the-night bargaining with my son to go back to his own bed. And it placed me, instead, twenty, thirty, forty years into the future, looking straight at the kind of grownups my kids will, G-d willing, grow up to be. Sincere, idealistic, passionate and caring people, parents, and Jews. That switch of blessing made me look into my children’s faces as I blessed them, suddenly free of the traces of frustration that tinge my motherly life all too often. And replaced, instead, by respect and anticipation for the adults they will become. Please God. I just had to share these incredible techniques to teach babies and toddlers to fall asleep on their own from Dina Friedman’s Chanoch leNaar Parenting Class. I tried this technique with my 7 month old, Tsofia, and within 3 days she went from beginning 100% dependent on me to fall asleep by nursing, to falling asleep peacefully 100% on her own. This makes my life A LOT easier. And it also means that Tsofia sleeps better (she used to wake up and cry until I nursed her back to sleep, and now she just falls back to sleep on her own) and also now she can fall asleep in her carriage when I’m out, instead of crying and being miserable until I get home and nurse her to sleep. -Get your baby used to a 1)Sleep 2)Feed 3)Play 4)Sleep cycle. -If your baby is breastfeeding, before trying this technique, consult with your doctor to make sure that your baby is not waking up and crying out of hunger. Continue this until you are out of the room for 10 minutes, and continue the 10 minutes out of the room, 5 minutes comforting cycle until the baby is asleep. – If he comes out again, return him to his bed, and close his door behind you. Continue this pattern until you are out of the room for 10 minutes— and continue the 10 minute, 1 minute cycle until your toddler is asleep. Hope this works for all of you tired eemas as well as it worked for me! Make sure to be in touch to update me on how this technique works for you—I will be interested to hear! Last Shabbat, for the first time ever I attended Friday night prayers at my favorite shul, the huge Belzer synagogue in Kiryat Belz, Jerusalem. When I arrived, there was an unusually large crowd in the women’s section, and I didn’t really know why until the Belzer choir started singing their otherworldly, sweet-as-honey Lecha Dodi niggun. You won’t believe me, but I think I could hear Hashem Himself singing along with the Chassidim in an undertone, and I imagined the angels above circling around to celebrate the beginning of Shabbat with all of the Belzers. The most moving moment of the Friday night prayers was when the little boys, hundreds of them, call out “Amen!” in unison. What a holy and unforgettable “Amen” it was! Hearing those little boys, I imagined the unfathomable tragedy of the million Jewish children murdered in the Holocaust. And I thought of these little Chassidic boys who are being raised keeping the same traditions as many of those lost children, speaking the same language as they did, and loving the Torah and mitzvot with all their hearts and souls– just like so many of those lost souls who lost their lives sanctifying G-d’s name. A tear came to my eyes imagining Hashem’s tremendous nachas to have such holy kinderlach filling His world and His synagogues once again. 2. This is a “Non-Sticker Chart,” which means that unlike old-fashioned sticker charts, you do NOT point the chart out to your kids and say “Whoever cleans up their toys 10 afternoons in a row will receive a new doll.” Instead, you just post this chart, and don’t say a thing about it. 3. When your child makes a high-level choice, with a lot of enthusiasm and fanfare you put a star on his chart. You tell him “You could have left your toys on the ground, but you made a high level choice instead! You cleaned up! You are are a Gibor, a hero! (Dina recommends that you feel your child’s arm as though you are feeling a muscle, and tell him you can feel how he is getting so much stronger, like a real hero). 4. Do not encourage your child by saying “I’ll give you a star if you clean up…” You just wait until after she has done the good thing, and give the star with fanfare. 5. When the child completes the chart, just erase the stars and start again. There are no prizes (remember, it’s a NON-sticker chart.) I made my own kind of prize though for my younger kids. Whoever finishes the chart gets to wear a conference pin that says “I am a Hero” to nursery school. They are SO PROUD to wear that pin! I didn’t think this Gibor Chart would work with my kids, since they are so used to sticker charts with treats or presents afterwards. 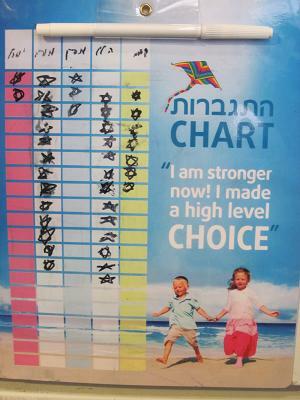 But my kids are incredibly motivated and excited about getting a star on the Gibor Chart. In general, using this Gibor chart has been phenomenally effective in helping my kids overcome their various personal challenges. 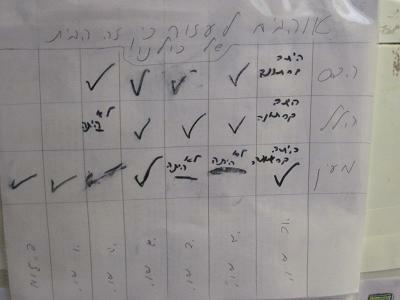 In fact, last week I was looking at the list of issues each child was working on during the first round of the Gibor chart, and in all cases the issue simply did not exist anymore! The star and encouragement has been a very surprisingly effective motivator! Truly incredible. 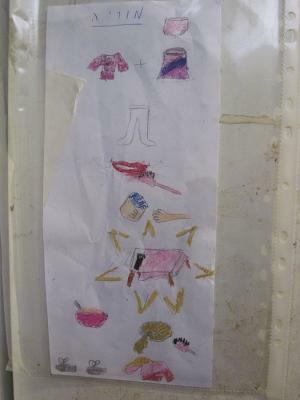 Dina recommends that children should have a chart including everything they need to do before they go to bed. Above is the chart I set up for my older girls to remind them of the one thing they were forgetting to do before they go to bed–their 10-minute nightly chore. This chart has meant that I no longer need to be the nightly-chore policewoman. I cannot tell you how much I love not having to nag! Another bedtime tool I LOVE from Dina is what she calls Bedtime Fun. What you do is you stagger bedtimes so that every younger child gets 10 minutes quality time ON HIS OR HER OWN with mommy. For bedtime fun, every child chooses what he or she wants to do with Eema. My 3-year-old son, for example, likes me to watch him doing somersaults on the bed for 10 minutes. My 5-year-old daughter likes reading, especially Amelia Bedelia. I love this time since it is so fun, and also because it is guaranteed one-on-one time with my little kids. I’d like to also start doing this with my 8 and 10 year old at one point. I so love Bedtime Fun, it’s one of the highlights of my day. 2. Make a chart, and post it in a place your kids can see it. 3. The next morning the kids use the list to get ready. No nagging allowed. Only encouragement (i.e., “Great, you have on your socks!” or “Thank you so much for getting dressed so quickly, that’s a big help so I can get to work on time!”). 4. If the child is ready on time, he or she gets to play with a certain toy or book that you reserve exclusively for mornings. These morning charts have brought about such a wonderful change in my mornings. I’m not sure how I ever managed otherwise! Yesterday I posted something about the Bateses of Tennessee with their 18 children, but I realized that it’s a shame to post only about a Christian family when there are so many JewishMOMs out there blessed with jumbo-sized families. And then I remembered the legendary Sima Zalmanov of Tsfat and her 19 children. I love this lady. She is such an inspiration. More than anything else, I love Sima Zalmanov’s clarity about the tough-ness of pregnancy and birth vs. the priceless gift of a new baby. Or, as Sima Zalmanov challenges her interviewer, “Tell me, if someone told you that you would have a difficult month, but that at the end of that hard month you would receive a million dollars, would you agree to it? I also love when she says, “Whatever the Holy One gives, we are happy. He knows what is best for us.” Simple but infathomably wise advice for all situations in life. Here is a news report about Sima Zalmanov and her family, with English translation provided below. Enjoy! Anchorman: Sima Zalmanov is 47 years old, and she already has 19 children and 7 grandchildren. Sima Zalmanov: Tell me, if someone told you that you would have a difficult month, but that at the end of that hard month you would receive a million dollars, would you agree to it? Interviewer: But pregnancy is nine months! Sima Zalmanov: If you had to suffer a bit for 9 months, would you do it for a million dollars? Interviewer: So you have 19 million dollars? Sima Zalmanov: At least! More! free time in a home without a computer or television? The Zalmanov family proves that this is a difficult mission, but that it’s definitely possible. All you need is 3 refrigerators, a 3-meter long kitchen table, a bit of faith, and, more than anything else, a good memory. Interviewer asks: Do you remember all of your children’s birthdays? Interviewer asks: Do you have plans for a 20th child? SZ: Whatever the Holy One gives, we are happy. He knows what is best for us. Whatever He does, we will be overjoyed. SZ (smiling): There’s always room.